Fifty Who Made DC Great (DC Comics, 1985). …which may seem a little silly at first, but that sure helped to keep Superman in the minds of kids. It’s no crazier than Donald Duck Orange Juice. The entries for Bob Kane and Bill Finger are interesting for what they say and don’t say, as noted here by Boys of Steel author Marc Nobleman. 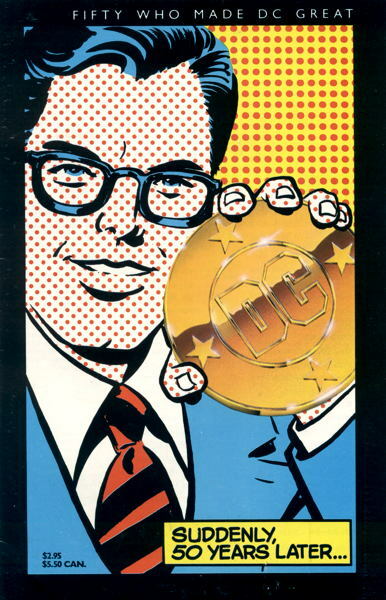 One of the neat things about this booklet were the caricatures, credited to Steven Petruccio, of some of the personalities involved, illustrating various aspects of that person’s involvement in Making DC Great. You can see examples above in that scan of the M.C. Gaines entry. 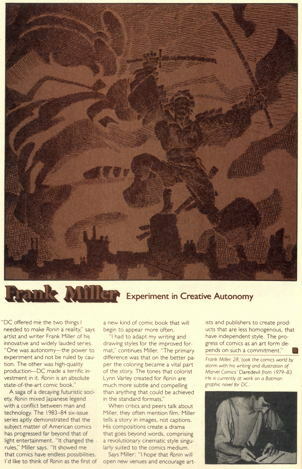 Bookending the publication are some color cover images of DC’s major publications with brief notes as to why they’re important, such as indicating that issue of New Fun from 1935 was DC’s first comic book. ( House of Secrets #92 is among those covers, making this yet another Swamp Thing appearance, kinda sorta, I had to own.) Along with those pics are quotes from notable folks occasionally about DC but mostly just about comics in general, from some diverse personalities as movie critics Gene Siskel and Roger Ebert, underground comix legend Richard Corben, the Muppets’ Jim Henson, Stephen King, and Stan Lee. I’m not even sure why I bought this at the time, beyond it catching my eye as the oddball release that is was, and perhaps appealing to my budding interest in the history of the medium. Plus, it felt sort of fanzine-y, and I do so love ‘zines. A couple more comments on this: I may have inadvertently stole my “Suddenly, [X] Years Later” gag from that cover. 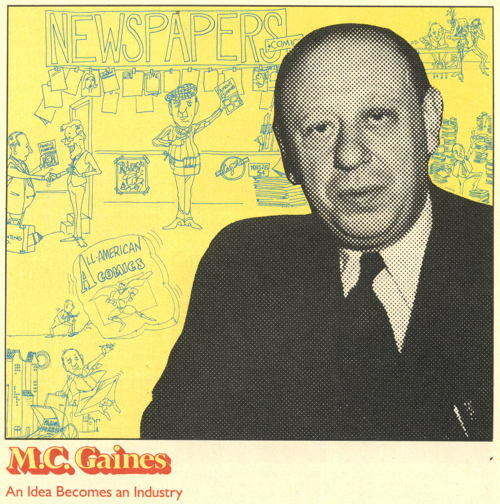 And, if DC were to put this out today, surely it would be Fifty-Two Who Made DC Great ! I have a copy of this somewhere. Thanks for the reminder. I’ll have to dig it out. As I may have told you, *I* stole “Suddenly, [X] Years Later” from a straight-to-video movie called BRAIN 17. Now, I am wondering if all of this is secretly interconnected by the Illuminati or the Council of Cross-Time Kangs. Are we not including the Halle Berry Catwoman movie as a big-screen adaptation starring one of DC’s heroines? Doron, you don’t remember when we all got together to decree that everything will be just like it was before that film happened, and no one will ever mention it again… under penalty of torture? Doron – I absolutely 100% completely forgot about the Catwoman movie. And I actually saw it. And even liked it, kinda. I thought the Catwoman movie was erased from existence by Flashpoint. No? 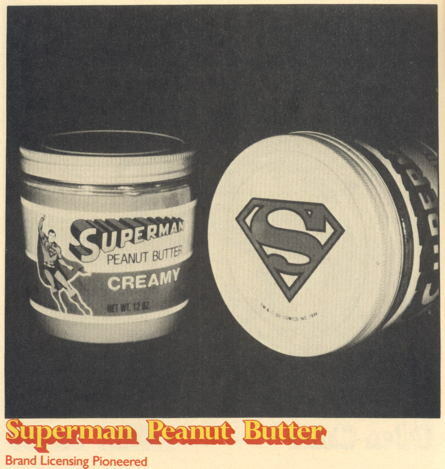 I shudder to admit that I found an unopened jar of Superman Peanut Butter from a quarter century of more ago in my Vast Accumulation of Stuff. I should probably call the EPA to arrange for its removal. Mr. Isabella, I will remove your antique, unopened Superman Peanut Butter for free. My fee is a spoon. Um, make that gladly remove. And take out the free part. Going back to bed. Peace all! Was Catwoman not a villain in the movie? Don’t worry about spoilers. I will never see it. I used to have a copy of this, and signed by Bud Plant, too, since he was one of the 50 and he used to offer to sign it if you bought it through his big ol’ catalog. Geez- half these guys are DEAD now. the villains were the producer, director, and writers!